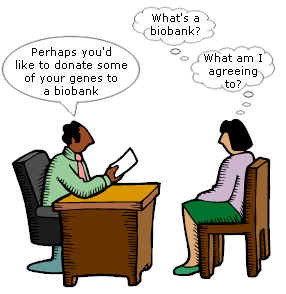 GeneWatch UK - Genetic Research - Who decides what medical research is done? Includes information on UK Biobank. Who decides what medical research is done? Some genetic research can bring benefits to health, but is genetic research always conducted in the public interest? This scientific paper looks at how data from twins and families is analysed. It concludes that the usual method is likely to exaggerate the importance of genetic differences in common diseases such as cancer. Breast cancer, for example, could often run in families because family members are exposed to the same environmental or lifestyle factors, rather than because relatives share some of their genes. If so, expensive research studies may be looking for "susceptibility genes" which do not exist or will be impossible to find. The Guardian: 500,000 people, a span of decades - and a waste of time and money? Abstract of an article by GeneWatch's Helen Wallace in the journal Critical Public Health. Please contact us if you would like a reprint of the article. The Observer: Scientist was paid consultant to tobacco firm.